Paul Bye, Surrey Commercial and Operations Manager for Lodge Brothers, is always looking for ways to get involved with the local community and following last years success at St Johns Church West Byfleet Summer Fair, Paul did not hesitate to offer his time again and booked a stall, the theme was the Queens official birthday and what does every good garden party need? Pimms!!! 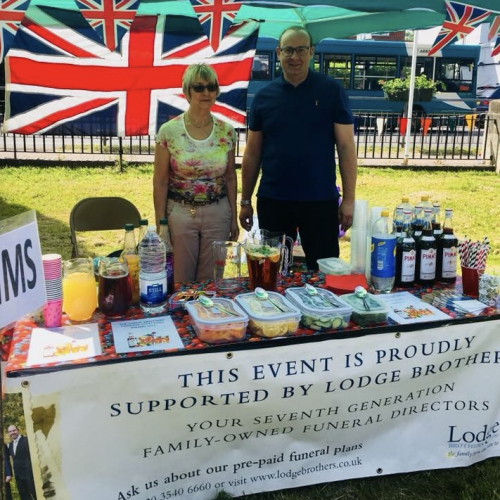 Paul was supported by Annie MacKender, branch arranger for West Byfleet, and his wife and daughter, as well as Chris Pearse a funeral operative for Lodge Brothers. “Parish Pimms” and “Soft drinks” were sold with all proceeds going back to St Johns Church fund, in total £460. 00 was raised for the church.